I have been dreaming of a little herb garden for the longest time. Unfortunately the balcony of my apartment is subject to fierce tropical sunlight and gusty winds thanks to the high floor. Only the hardiest plants survive these conditions and I have not succeeded in growing herbs successfully for the longest time. This weekend I finally got down to my pet project of creating a mini herb bench (not quite a garden). 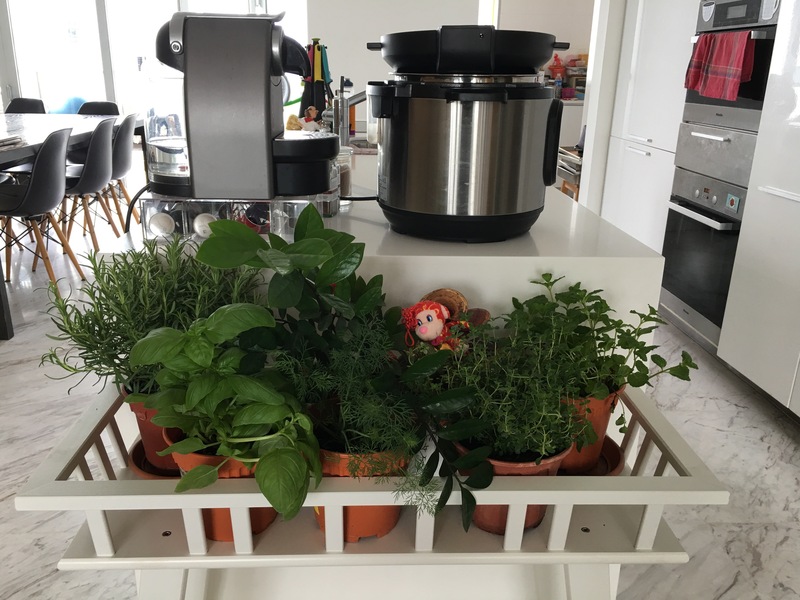 I was really pleased too that I managed to find a really nice stand for the herbs in Ikea. Of course when I was in Ikea I had to walk past the bistro which was serving Swedish meatballs. 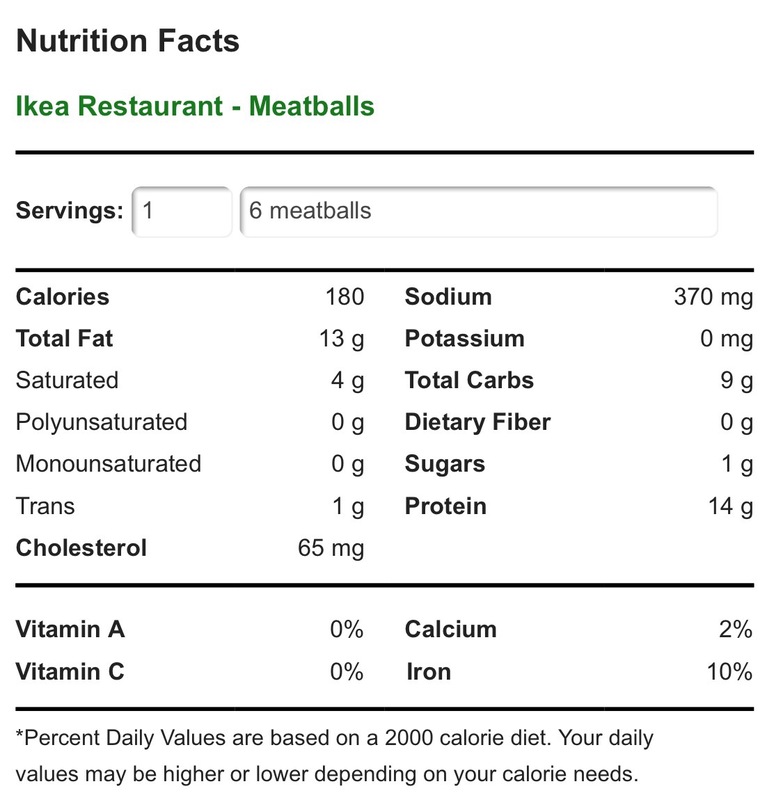 My kids absolutely adore the meatballs from Ikea. Unfortunately these little things are actually pretty carb-laden. 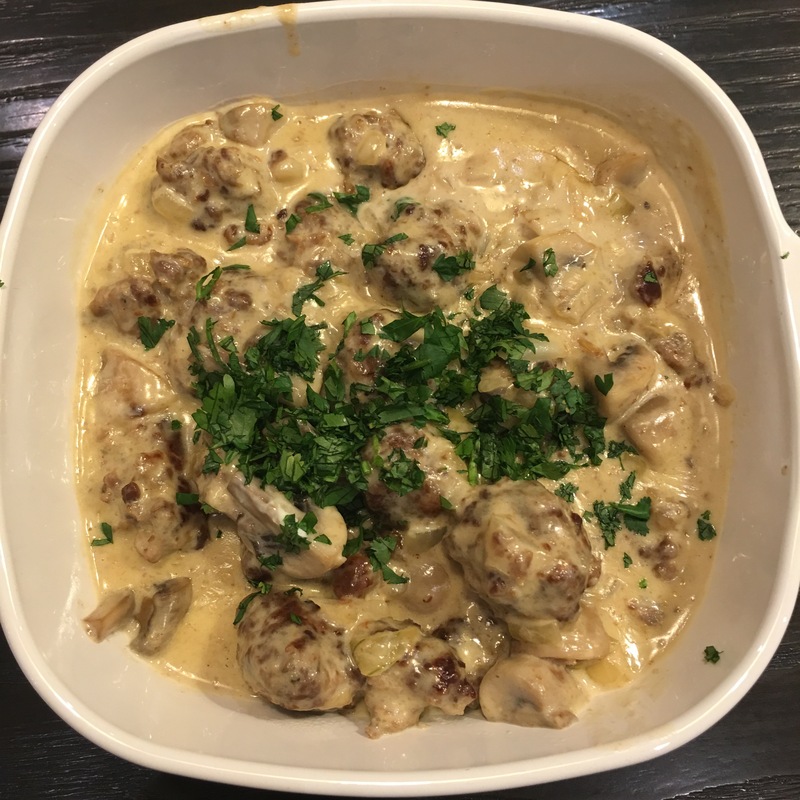 So in answer to my craving for Swedish meatballs, I decided to make a quick and relatively low carb version. The weather turned rainy while cooking, which made it a wonderful setting for a definite comfort food classic. There is truly nothing like the succulent meatballs oin creamy sauce over cauliflower mash. Both hubs and the kids gave this dish a thumbs up! Using a food processor, grind the crackers to make crumbs. Mix the beef, pork, cracker crumbs, minced onions, salt, pepper and allspice, heavy cream and beaten egg together. It is probably most effective to get your fingers into the ingredients to mix it up well. Form the meatballs about 1 inch in diameter, and lay the meatballs in a non-stick baking tray. Heat up some vegetable oil in a non-stick skillet and sear the meatballs all over. Set aside. In the same skillet, sauté the garlic and onions till lightly caramelized. Add the mushrooms and sauté further till slightly softened. Add the meatballs back into the pan and add the heavy cream, sour cream, salt, pepper and Worcestershire sauce. Bring the sauce to a simmer. Place into a deep dish and top with chopped parsley. Serve with cauliflower mash for a true comfort food experience.